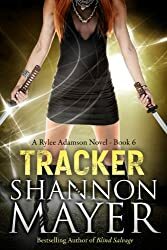 Tracker is book six in the Rylee Adamson novels by Shannon Mayer. Orion is making a bid for the world and the vampires still want Rylee to make them vampire ruler. Things are getting interesting. Rylee has been blackmailed into helping Faris with the challenge to become vampire ruler, even if she doesn’t want to. Liam must deal with human weapons that work on the supernatural, although he hates being separated from Rylee. Tracker pulls together all the final threads before its time to start preparing for the demon threat. The vampire issue settles down and Liam and Milly find their uneasy truce. Rylee’s family comes together to pull them through one more seemingly impossible situation. If you like the sound of these books, and I think you will, you can check out the rest of the series here or via author Shannon Mayer’s website. She’s got a couple other series and some stand alones that are pretty great too.